The cards listed in this section are supported in bots for Teams. They are based on cards defined by the Bot Framework, but Teams does not support all Bot Framework cards and has added some of its own. Differences are called out in the references below. You can find additional information on how to use cards in the documentation for the Bot Builder SDK (v3). There are also code samples available in the Microsoft/BotBuilder-Samples repository on GitHub. This table shows the types of cards available to you. Adaptive Card Highly customizable card that can contain any combination of text, speech, images, buttons and input fields. Hero Card Typically contains a single large image, one or more buttons, and a small amount of text. List Card A scrolling list of items. Office 365 Connector Card Flexible layout with multiple sections, fields, images and actions. Receipt Card Provides a receipt to the user. Signin Card Enables a bot to request that a user sign in. Thumbnail Card Typically contains a single thumbnail image, some short text, and one or more buttons. Your card can contain an inline image by including a link to your publically available image. For performance purposes we highly recommend you host your image on a public content-delivery network (CDN). Images are scaled up or down in size while maintaining the aspect ratio to cover the image area, and then cropped from center to achieve the appropriate aspect ratio for the card. Images must be at most 1024×1024 and 1 MB in PNG, JPEG, or GIF format; animated GIF is not officially supported. Buttons are shown stacked at the bottom of the card. Button text is always on a single line and will be truncated if the text exceeds the button width. Any additional buttons beyond the maximum number supported by the card will not be shown. See Card Actions for more information. See Card Formatting for more information on text formatting in cards. 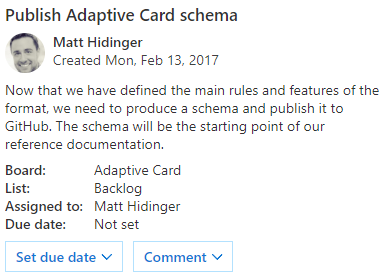 Only version 1.0 of Adaptive Cards is supported. A customizable card that can contain any combination of text, speech, images, buttons, and input fields. A card that typically contains a single large image, one or more buttons and text. The list card has been added by Teams to provide functions beyond what the list collection can provide. The list card provides a scrolling list of items. buttons Array of action objects Set of actions applicable to the current card. Maximum 6. Does not render on mobile. Supported in Teams, not in Bot Framework. The Office 365 Connector card provides a flexible layout with multiple sections, fields, images, and actions. This card encapsulates a connector card so that it can be used by bots. See the notes section for differences between connector cards and the O365 card. 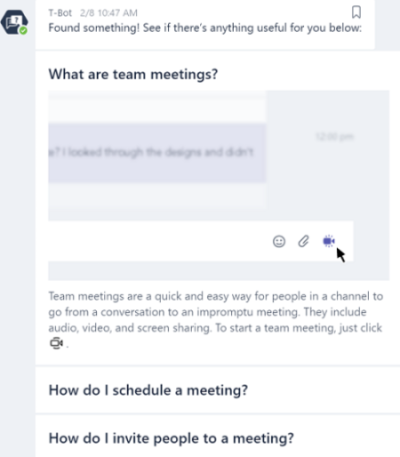 Office 365 Connector cards function properly on Microsoft Teams, including ActionCard actions. One important difference between using Connector cards from a Connector and using Connector cards in your bot is the handling of card actions. For a Connector, the endpoint receives the card payload via HTTP POST. For a bot, the HttpPOST action triggers an invoke activity that sends only the action ID and body to the bot. To use Connector cards in your bot, we recommend using the O365ConnectorCard class in the Teams extensions for the Bot Builder SDK for .NET or Node.js. You can simplify handling of the HttpPOST action by using the onO365ConnectorCardAction method. Each Connector card can display a maximum of 10 sections, and each section can contain a maximum of 5 images and 5 actions. Any additional sections, images, or actions in a message will not appear. All text fields support Markdown and HTML. You can control which sections use Markdown or HTML by setting the markdown property in a message. By default, markdown is set to true; if you want to use HTML instead, set markdown to false. If you specify the themeColor property, it overrides the accentColor property in the app manifest. To specify the rendering style for activityImage, you can set activityImageType as follows. 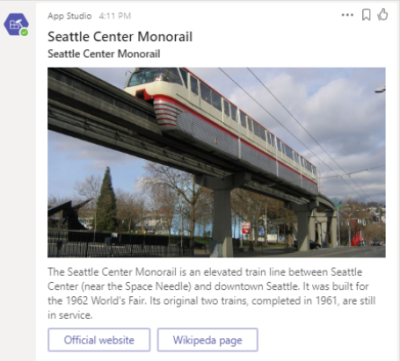 If you are using .NET and C# or Node.js, you can use the O365ConnectorCard class in the Microsoft Teams extensions for the Bot Builder SDK to send Connector cards from your bot. A card that enables a bot to provide a receipt to the user. It typically contains the list of items to include on the receipt, tax and total information, and other text. A card that enables a bot to request that a user sign in. Supported in Teams in a slightly different form than is found in the Bot Framework. The signin card in Teams is similar to the signin card in the bot framework with the exception that the signin card in Teams only supports two actions: signin and openUrl. The signin action can be used from any card in Teams, not just the signin card. See the topic Microsoft Teams authentication flow for bots for more details on authentication. A card that typically contains a single thumbnail image, one or more buttons, and text. "value": "I don't like it"
Card collections are supported in Teams. Card collections are provided by the Bot Framework: builder.AttachmentLayout.carousel and builder.AttachmentLayout.list. These collections can contain Adaptive, Hero, or Thumbnail cards. The carousel layout shows a carousel of cards, optionally with associated action buttons. A carousel can display a maximum of 10 cards per message. Properties are the same as for the hero or thumbnail card. The list layout shows a vertically stacked list of cards, optionally with associated action buttons. A list can display a maximum of 10 cards per message. Some combinations of list cards are not yet supported on iOS and Android. The following cards are implemented by the Bot Framework, but are NOT supported by Teams.